Your smart choice of payment worldwide. ACLEDA VISA Credit Card is a secure card which designed with the high-end layer of security recognized by the Payment Card Industry Data Security Standard (PCI DSS), and provide security for customers using credit service can operate their banking services via ATM, POS terminal, or e-commerce to make withdrawals or pay for goods/services up to the existing credit line or up to the credit limit set by ACLEDA Bank. ACLEDA VISA Credit Card is an alternative tool of payment that can be used for all kinds of transactions, from daily shopping to online transactions. "ACLEDA VISA Credit Card is added the most secure technology by requiring to enter One Time Password (OTP)  that is sent to your registered mobile phone number via SMS  (it also can be used with Soft Token  or Hard Token ) when making online payments (e-commerce)." Currency type is available in US dollar. If you make withdrawal or payment via ACLEDA VISA Credit Card in other currency, the system will convert it automatically based on the VISA's exchange rate at the time of settlement. Enter an incorrect PIN 3 times consecutively, your card will be blocked (for using with ACLEDA ATM and ACLEDA POS). 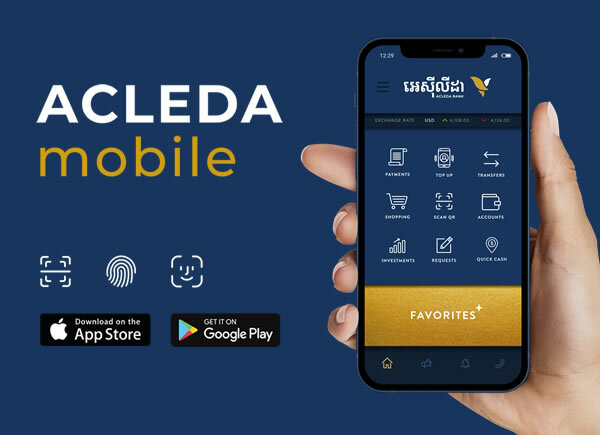 If your card is lost or stolen or your PIN is disclosed or comes into the knowledge of a third person, you must immediately notify ACLEDA Bank 24 hours to Call Center at +855­ (0)23 994 444 or +855­ (0)15 999 233. One Time Password (OTP): It is a password used for only one transaction and will be expired within 60 seconds. It does not require to remember. This OTP is required to enter when making online payments with websites that have the sign "Verified by VISA".